The robot that ran over a child, Knightscope, wants money and they need it. Investors can invest as little as $1,000 to participate and Knightscope is hoping for a total of $20 million. An $80 million pre-money valuation has been set, up from $45 million in their Series B round completed 6 weeks ago. Knightscope also has touted $60+ million 'investor interest' but that was an unvetted marketing stunt. The Series m Preferred Stock will also have no series-based votes or protections. Therefore, investors in this offering will not have the ability to control the board of directors and will not have significant ability to control any specific vote of stockholders. Is that a good deal? If you think their robots are going to take off and see hockey stick growth, sure. And they are ambitious, aggressive marketers who have done a great job of getting people excited about the science fiction aspect of robots and their hope to cut crime by 50%. On the other side, it is not clear how their robots are going to solve crime or even be more than just surveillance cameras on a scooter. And at ~$60,000 per year per robot, it is too expensive for most organizations to be a gimmick. The bet here is that Knightscope can transition from its media appearances to actual everyday business benefits for regular security operations. Update August 2017: SeedInvest reports that Knightscope has raised $10 million. That's an average of ~$3,333 per investor given the 3,000+ investors SeedInvest reports has participated. 60,000 per year is where its gonna fail. You can hire a human for that? If im gonna buy a robot, its gonna be because I can save salary costs over a human. 60,000 per year is where its gonna fail. According to Knightscope's marketing people, that's just $7 an hour if you assume the user wants to run it 24/7/365 and it never needs to be charged or maintained, questionable assumptions. You can hire a human for that? They are from Silicon Valley where wages are far steeper than the rest of the company. That said, $60,000 per year is still definitely a lot of money given the various limitations robots have.  And they will have increasing numbers of competitors (e.g., the list in the post) who will price significantly lower than them, which will cause downward pressure. Companies generally don't hire guards directly, they contract them through providers like G4S, Allied, Securitas, etc. Those companies have a fair amount of markup on the straight overhead of the guard's salary. The guards bill out in the range of $15-$20/hr. to the end user, even though the actual human guard himself is only making $8-$10/hr in many cases. Knightscope, and the other robot companies, are hoping to make the argument that a $7/hr robot is a better deal than a $20/hr guard, and that the robot can do enough to be worth the money (e.g., if the robot is ~1/3 the cost, and at least 1/2 as functional/useful, it is a good deal). If the concept works, the guard companies might just go directly to Chinese suppliers and source units directly, skipping over Knightscope and the other companies. 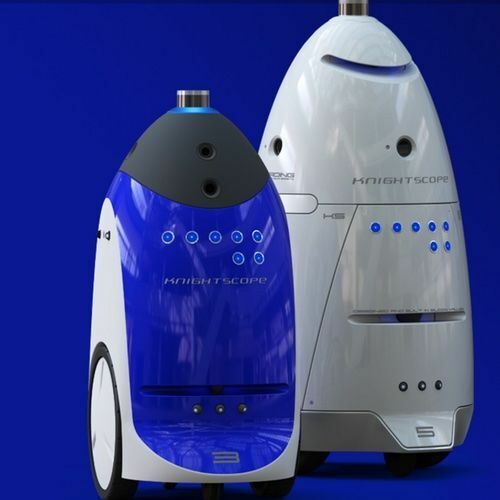 Or, we will see Hikvision come out with a security robot that costs a fraction of the Knightscope unit. That's a crooked argument and both you and Knightscope know it. The $20/hr guard is paid when s/he works. If you only want a guard 40 hours a week, you pay the rate for 40 hours, 80 hours, 80, etc. With Knightscope, it's only $7/hr if you use the robot 168 hours a week for 52 straight weeks (given the ~$60,000 annual contract). Net/net, the actual cost comparison is much much closer, even without factoring in a human's superior all around capabilities. First of all, let it be known that I dislike these stupid robots (at least with their current capabilities anyway). And on top of that, I dislike the go-to-market strategy used by this company - for many of the reasons everyone has posted in this string. "Net/net, the actual cost comparison is much much closer, even without factoring in a human's superior all around capabilities." When framed using your example 'if you only want a guard 40 hours a week' I agree. But wouldn't you agree that there are numerous sites that employ 'round the clock security staff? Even at the low end of BRKs $15-$20/hour scale that would be at least $131,040 a year. More than double the $60k these guys charge for that K5D2. "First of all, let it be known that I dislike these stupid robots (at least with their current capabilities anyway). " But wouldn't you agree that there are numerous sites that employ 'round the clock security staff? The challenge with Knightscope is that the pricing is not flexible. It's ~$60,000 flat, whether you need it or not for certain hours. A guard contract is more flexible. You might really want a guard during certain times of day and you can hire that guard just for that time frame. And a guard can climb stairs and open doors, which are legitimate issues for Knightscope. So you need to find users that value the robot 24/7/365 and do not have any these logistical restrictions that the Knightscope robot cannot handle. 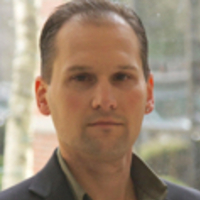 Knightscope has yet to make clear what market segments are strong fits for that. The best market fit they have shown is gimmicks / tech demos like Microsoft and the Sacramento Kings. Knightscope can get on an elevator though. The fallacy that I see with these robots over and over again is the belief they can operate autonomously. That's not the case. There still is a guard or someone else watching the video feed or alert events. Even if that guard is watching 10 robot feeds they still have a cost. If the robot could call the police or deploy pepper spray autonomously it may be a different story. Watching their one video, a brand new work van? Looking at it all, for only being 2-3 years old, their expenses are out of control and not managed very well. Each executive making north of 70-100k/yr is not smart for a startup. If the robots were selling like hot cakes, sure, pay the execs 100k+...but theyre not, and they need to be paid based on sales performance. Relative to Silicon Valley startup compensation standards, those compensation levels do not strike me as high. As for sales performance, the VP Marketing & Sales is making $130,000 which is not a lot of money given the very high cost of living in their Mountain View CA base and what tech startup VPs of Marketing and Sales make. Sales & marketing expenses are actually really low, at an annual pace of a quarter million dollars, especially given all the media exposure they have gotten. Our general and administrative expenses have increased significantly from $238,896, in the year ended December 31, 2014, to $654,844 in the year ended December 31, 2015. This increase reflects a doubling in our real estate footprint, marketing expenditures at trade shows, insurance costs and operating costs. 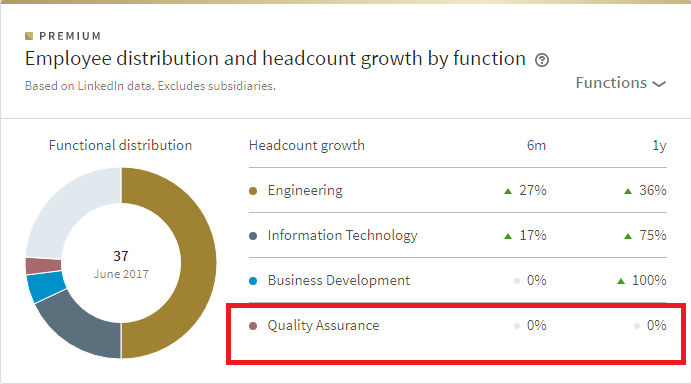 Similarly, that R&D is only $3,510 for 6 months is strange but it must be they have categorized R&D expenditures for employees under 'compensation & benefits'. For a company that reports 25 full-time employees in a Silicon Valley tech startup, their expenses strike me as normal. The bigger thing to me is revenue. How many customers can they get to rent robots for $61,000 a year? That is if they don't mind working the trade show circuit doing promotions. Lol, yes, as of right now. I think you know I meant in the future. The Knightscope case will be something like (I am making this quote up but the general theme is likely correct): "Hey we signed on Securitas and Allied Universal. These companies are huge in the guard market. Even if they only sell / lease 1 robot for every 1,000 guards they use, that will be 700 next year and we'll be rolling in cash." I don't know enough about Securitas and Allied's commitment and success selling the robots. This could be it, the floodgates could open and robots could be all over the place or one or both could quickly (and silently) abandon this as they realize it is more gimmick than solution. I like children that aren't run over and for that reason, I'm out. For you Millennials out there... we all know you don't have cable TV, unless you live in your parent's basement. My above comment was a Shark Tank reference. I have cable, and I'm a millennial. My kids refuse to watch broadcast TV, though. They hate commercials. If this robot can kill rats and vacuum while it roams around in the middle of the night it my be of some use. It also needs to be able to use an elevator and turnstile gate. Integrations with other building systems such as lighting, HVAC and Fire can be monitored and optimized. Gee, I just cannot wait to get my first parking ticket from one of these bad boys(email form only please). Knightscope says cost of building a K3 or K5 robot is in the range of $55,000 to $65,000. 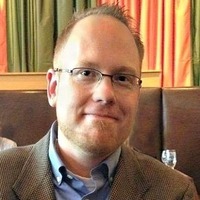 When a small, young company gives revenue guidance with $400K of uncertainty, that's a problem. 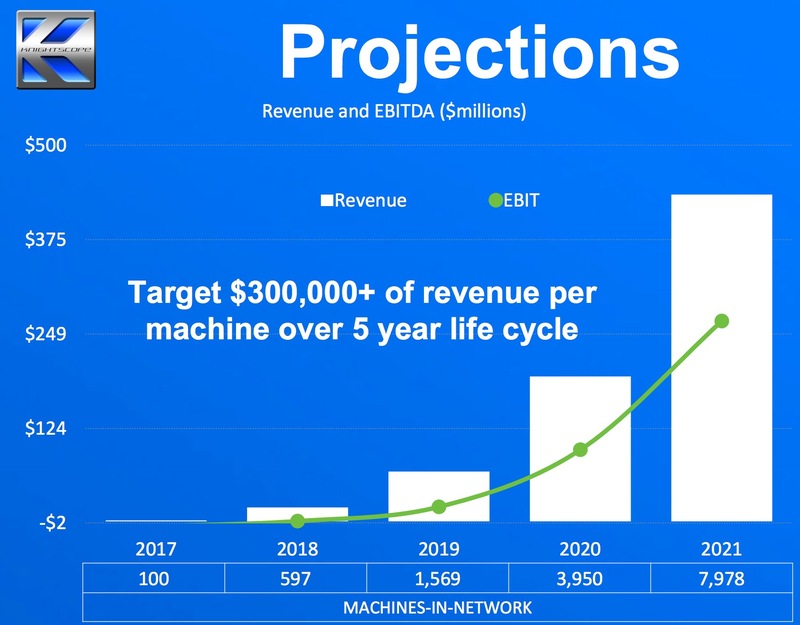 In their case, simplistically that would require collecting annual operating fees (I doubt companies give them $60K up front) for almost 7 additional robots to hit the $1M figure (assuming they were already at $600K when the statement was made - they probably were not). If it costs them $55K-$65K to build one robot, I have to assume there is significant lead time as well. I also have to assume they don't happen to keep multiple units in stock to satisfy unpredicted surges in demand. Doesn't pass the sniff test. Neither does the hockey stick growth to $5M. When a small, young company gives revenue guidance with $400K of uncertainty, that's a problem. On the call, they alluded to some large deal they are hoping to close by the end of the year. I am not sure how they recognize revenue but since they typically have 'contracts with a typical term of 12 months' not sure how they could recognize all that revenue right away. Neither does the hockey stick growth to $5M. Having a big jump in revenue in the second year of sales is fairly common as sales and marketing ramps up from a very low base. The $5M is an average of 83 robots contracted for 2017. That said, I do not know enough whether they can do that but ~100 or so robots for 2017 does not sound like a crazy plan if they actually solve some real security problem (which I am still not clear about). A strange announcement from Knightscope: "Knightscope Announces the K7 Autonomous Data Machine"
It is also not clear if $1 million is enough for the K7 development, since their $15 and $20 million investment milestones list far more spending on the K7. Knightscope has competition on the 4 wheel side, with both Sharp and SMP focusing there. $1 million is not even enough to develop a new camera (I don't mean relabelling or slightly modifying something from Dahua/Hikvision/whatever, but laying out something custom and developing firmware for a specialty application like analytics), let alone an entire robot. They will spend more than $1M just on testing, QA, certifications, and stuff that is not related to core development. The whole thing is weird. It feels like the announcement of the K7's 'development' commencement is just a way to hype unsuspecting investors. We have limited experience in operating our machines in crowded environments and increased interactions may lead to collisions, possible liability and negative publicity. However, there can be no assurance that a collision, with property or with humans, will not occur, which could damage the ADM, or lead to personal injury or property damage and may subject us to lawsuits. I tried out the Knightscope's robots human avoidance capabilities at the ASIS show and found it pretty solid. I tried at half speed to run into it and it did a good job of stopping quickly and/or redirecting away. Obviously, I wanted to avoid causing a scene / knocking the robot / getting run over but it was solid in my limited interaction. That said, kids can be unpredictable in their movements / shifts so them colliding into one is something I still could see. I tried out the Knightscope's robots human avoidance capabilities at the ASIS show and found it pretty solid. I tried at half speed to run into it and it did a good job of stopping quickly and/or redirecting away. "Sir, John Honovich, aka mrrobot, aka im-not-interested-in-knightscope at 12 o'clock"
"What the heck is he doing?" "Either the Tango or the Cha Cha Cha"
I'm 6'4" and look forward when I walk because I am scanning for threats and beautiful people, I therefore have a 2-3' blind spot down low in front of me when I walk. I have unintentionally kicked small kids when they abruptly run in front of me. I think what I'm saying is that I am a fully aware and logical machine and I still collide with little ones when they act semi-feral. It is foreseeable that a robot would do the same if confronted by the same. Humans will need to yield to robots the same way we do with skateboarders and fast motorized wheelchairs. Not trying to be funny, just think we need to yield to anything fast and/or motorized and be responsible for our safety. Humans will need to yield to robots the same way we do with skateboarders and fast motorized wheelchairs. But that's why skateboarders are prohibited in certain areas, like many malls. Most wheelchairs I have seen are pretty slow. we need to yield to anything fast and/or motorized and be responsible for our safety. To the contrary, society has already accepted that there are many areas where fast and/or motorized are not allowed. To that extent, it is a limitation for Knightscope. For that reason, I think the 4 wheelers have potential, as they will go in areas where fast / motorized vehicles already are accepted and over longer distances that might be problematic / costly to cover with humans. Do you think capable drones would be a better choice for security-patrols in the common areas of a spacious indoor populated area like a shopping mall? Audible gunshot detection, code-blue emergency box response, missing child searches, reports of disturbances and gathering suspect descriptions, etc. I still prefer a ton of fixed cameras, but like the idea of augmenting with a mobile machine that could very quickly respond to criminal acts to get a situational report for security and first responders, and could also augment security staff patrols the rest of the time. I don't know enough about how drones work to comment. One issue with the one drone startup we covered is the short battery lives. However, they can go much faster and avoid obstacles better. focus exclusively on growth in the greater metropolitan Mountain View area, pay criminals to 'get caught' by roving 'pro bono' K5s, sue kid who made k5 run him over, stiff debt facility. meltdown the K5s for copper, cancel subscription to Robotica, and relocate to a van to be parked down by the river. More than 80% of our components are manufactured in the United States. This is a peculiar way to describe the K7 since 'production' means ready to deliver to customers, while where they are at is at the opposite end, the start of development. Eight of the contracts were executed through December 31, 2016 representing $669,758 of total contract value and three additional contracts were executed during January 2017 with a $404,923 total contract value. Including these contracts and based on unaudited operating results, the Company’s revenues were in excess of $400,000 through December 31, 2016. So 2016 total revenue of $400,000 vs $80 million pre-money valuation for a fairly rich 200x price to sales ratio. For January, about 6-7 robots contracted to 3 customers. On the plus side, someone is buying them. It will be interesting to see how well they scale up sales. 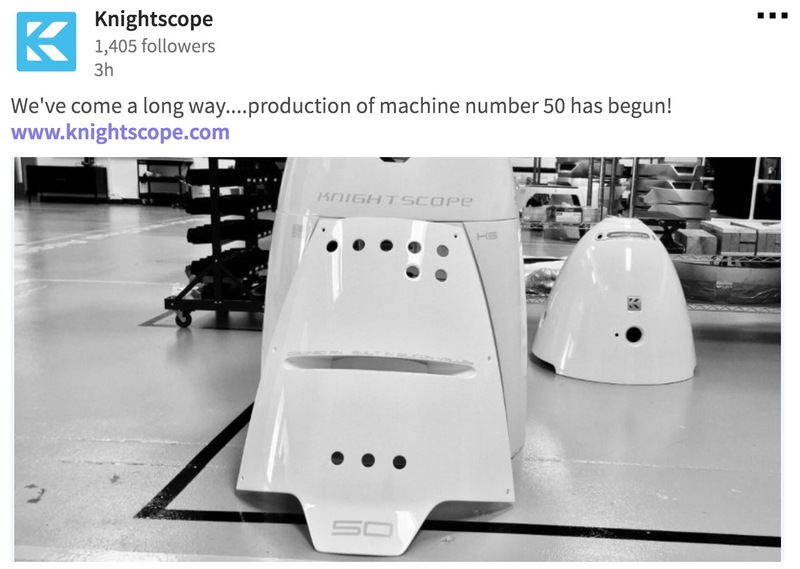 Knightscope says they are producing their 50th robot. As of December when this post was released, Knightscope claimed 15 in operation and a undisclosed number for demoes / testing / beat up by drunks etc. There have been 145 business days (e.g. : M-F, excluding weekends and holidays) between Dec 9 2016 and now (July 9 2017), according to this calculator. In that time, Knightscope has produced an additional 35 robots, giving them a pace of 1 robot every 4.1 days. Update: Knightscope is now reporting 2,000+ investors though the total amount invested across them is not disclosed. The $20 million fund raising has now been open for more than a half year. It will be interesting to see how many literal 'mom n pop' investors they get. A saw this product at ASIS, and it seemed that every time I passed by, there was a tech working on it. Update: This 8 month old post has gotten ~2,000 reads in the past week, ~90% via search. This post is a 1st page result for Knightscope, which contributes and, of course, the drowning robot. The question is: Is this burst of interest in Knightscope good for the company overall? Evidently, he visited this report and thinks we are either Knightscope or associated with them. His due diligence is not good. Based on your comments above, I imagined myself a potential investor in Knightscope..... so I did a little non-standard due diligence to see if I could get some kind of idea who this company is and why I should give them my hard-earned money. When doing a simple Google search, the returns are dominated by the recent drowning of the K5 known to the locals in DC as Steve. But if you look beyond that, you can find some interesting things. 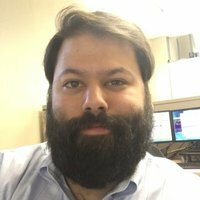 What is the background of the people running Knightscope? Here is a recent article about the bankruptcy of the previous company the people that are running Knightscope used to run: Carbon Motors (Note the date of that article is June 2013 - the same month Carbon Motors filed for voluntary Chapter 7 bankruptcy). This all occurred 2 months after their new company Knightscope was already formed (see pic below). 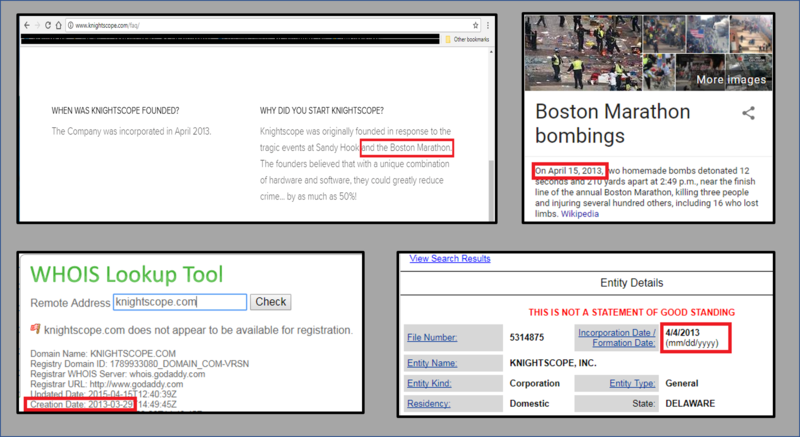 At the bottom of their own FAQ page, under "Why Did You Start Knightscope" they say that "Knightscope was originally founded in response to the tragic events at Sandy Hook and the Boston Marathon." ...may he rest in pieces. *I am not a lawyer, nor licensed to give professional financial and/or investment advice. So you will have to come to your own conclusions. Update: SeedInvest just reported that Knightscope has raised $10 million. That's an average of ~$3,333 per investor given the 3,000+ investors SeedInvest reports has participated. Knightscope is still seeking $20 million max and has to October 10th to do it. Cough...Cough...someone is bluffing at Seedinvest. Who in their right mind wouldnt do their due diligence with investing?